Ryan Mathews' career-long run is 51 yards. Branden Oliver just went for 52. It's just an interesting stat. Chargers now 10-12 on 3rd down. Jets 0-6. Ha… tech giant > RT @sdutCanepa : Play clock conks out. Qualcomm can't even keep time. I like the new @BFTB_Chargers , giving me more shout outs than the old one. The refs need to stop this fight. As everyone races to add Branden Oliver in their fantasy leagues. 163 total yards and two TDs for #Chargers RB Branden Oliver. 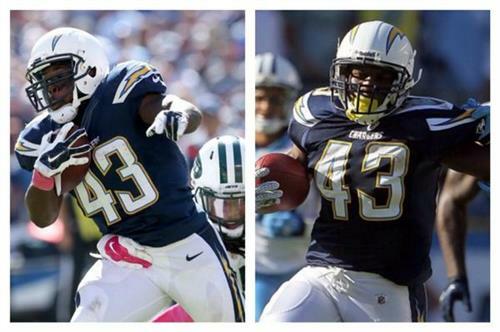 I added him last week :) RT @BFTB_Chargers : As everyone races to add Branden Oliver in their fantasy leagues. Seyi Ajirotutu is so good on special teams. He's such a valuable player on this team. 60 for the Jets was out of control at the end of that play. Once again, #Chargers dominating TOP - 27:30 to #Jets 11:58 and it's another hot one at Qualcomm. Reminder: I’m tweeting from @BFTB_Chargers today. Blue Angels flyover at the Q. Don't think it was planned. Who had Branden Oliver in "first Chargers RB to run for 100 yards in a game" pool? Because he just did it. Ugh. Injury wasn't how I wanted to see Troutman lose his spot. Brandon Oliver has more rushing yards today than any other Chargers RB has the entire 2014 season. 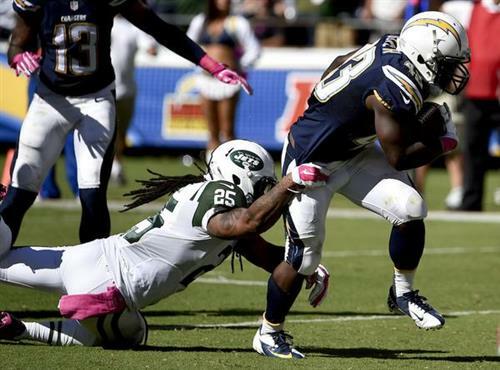 Branden Oliver has more rushing yards today than any other Chargers RB has the entire 2014 season. 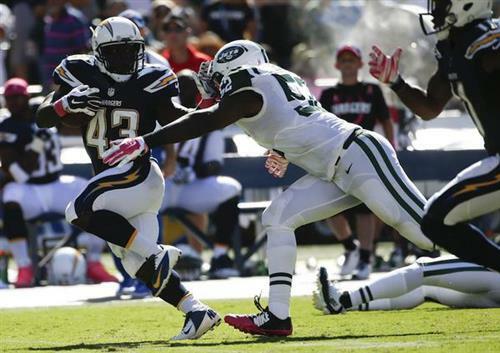 #Chargers up 31-0 over #Jets . Last shutout for SD was 12/12/10 vs KC and score was 31-0.
.@BFTB_Chargers Correction. Actually a few yards short when you count Brown's yards today. Could easily get it in 4th quarter. Darrell Stuckey questionable to return with a quad injury. Chargers' safety Darrell Stuckey has a quad injury. His return is questionable. I was really nervous these clown referees were going to call something on Gilchrist there. Great play by 38. I'm not sure I like Keenan Allen returning punts in a game that's already decided. Maybe someone should tell Keenan Allen to just get a couple of yards and run out-of-bounds on punt returns with your team up 31-0. Branden Oliver has 172 yards from scrimmage today. That's the exact total Donald Brown brought into the game. Great. RT @John_Gennaro : So, the #Chargers pass defense looks great or nah?